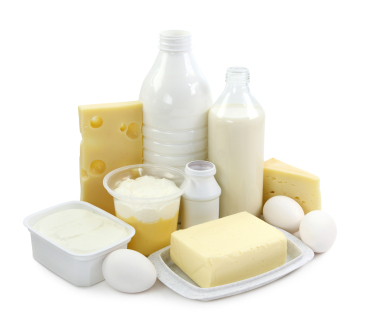 Pasteurized dairy is heated to high temperatures to kill pathogenic bacteria. Most dairies—including those that sell pasteurized, organic milk—often have filthy cesspools with cows standing in manure several feet deep. The factory dairy cow is also fed a mash full of antibiotics and hormones such as rBGH, waste products, and sometimes meat from infected animals, even though the cow is an herbivore (vegetarian). Avoid pasteurized yogurt, cream, butter, cheese, cottage cheese, and ice cream. Very few of us can truly digest today’s commercial dairy products. The reason for confining our cows in feedlots and feeding them grain rather than grass is that they produce more milk—especially when injected with biweekly hormones. Today’s grain-fed cows produce three times as much milk as the old family cow of days gone by. Unfortunately this industrial process leads to health concerns for both the cows and those who drink their milk. Products from grass-fed animals offer a balanced ratio of omega-3 to omega-6 fatty acids. On the contrary, industrialized animals whose diets are made up of grain have a high concentration of omega-6 fat which contributes to many diseases. Animals who eat grass contain at least two to four times more omega-3 fatty acids in their meat and milk. These omega-3s are formed in the chloroplasts of green leaves and algae that they consume. Additionally, the protein in pasteurized cow’s milk is the leading cause of food allergies in both adults and children. The fat in pasteurized and homogenized milk has been altered and no longer comes with the lipase enzyme that is needed by the body to digest the milk fat. Ask around. You’ll be surprised to find how many people have already figured out that giving up pasteurized dairy has decreased the number of colds they get, the sinus problems they have, the number of ear infections their children get, and the amount of bloating they experience. Raw dairy is a superior food, but only if you can obtain if from a farmer who has healthy animals that eat green nutrient-dense grass and has its enzymes intact. For more info view our raw milk Resource Guide.